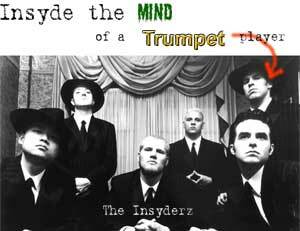 The Insyderz are one of the best ska-core bands around. They've spent the last 2 years creating 3 great albums (with another on the way), touring the country, and just plain making great music. Trumpist Bram Roberts dropped his brass for a moment while recording Skalleluia 2 to answer some questions. This interview took place on: 4/23/99. Jesus freak Hideout: Why the name, "Insyderz?" Bram Roberts: Duran Duran was taken. It's from Col. 4:2. The world are the outsiders, so we must be the Insyderz. Bram: Joe and Nate started leading worship at their church, and decided to form a Ska band. Bram: Harder edged ska with punk and metal influence. Bram: Bosstones. Britney Spears. POD. JFH: What is the song "The Hunted" about? Bram: It's from a dream that Joe had. The devil is after him, but through the power of the Lord, the tables turn. JFH: What inspired the song, "Forgive and Forget?" Bram: It's about Joe's Dad who left the family when Joe was in high school. The claw is a goofy thing that was when Joe's Dad tickled him, but it's really symbolic of a child's fear and the need for a father's love. JFH: What is the story behind the hidden track on your new album, Fight of My Life? Bram: It was written and performed by our buddy F. Albert Lenz who toured with us. Each line has some kind inside joke from tour. JFH: What is your favorite Insyderz song? Bram: Buddy Boy. Listen and you'll know what it means. JFH: What is your favorite scripture verse? JFH: What does the future hold in store for the Insyderz? Bram: Lot's of rock. Lot's of love. Lot's of God. Bram: My girlfriend Heidi is the hottest girl in the world. Um... uh, sure, Bram. Well, thanks! Looking forward to Skalleluia 2!